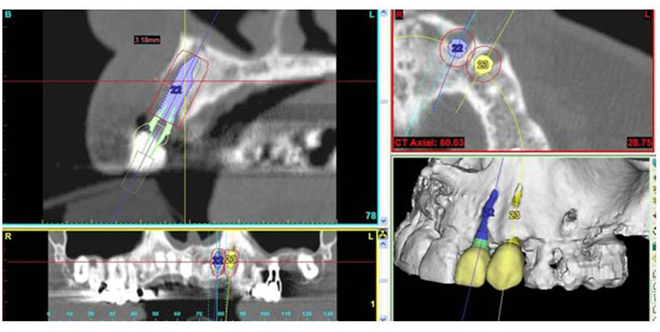 Computer guided surgery is a virtual system that improves the reliability and accuracy of implant treatments and enables the execution of treatment planning based on 3D jaw modeling. quantity and quality of the patient’s bone structure in 3D. positioning as well as the bone augmentation. 12 years of experience in guided surgery! Dr. Tremblay has been practicing guided surgery for more than 12 years and is renowned worldwide in his field. At our implantology clinic, you will have access to state-of-the-art implant treatments. This procedure is less invasive and traumatising for the patient. It is now possible to position implants with ideal emergence profile. Pain tolerance management: Dr. Tremblay uses pain free surgical techniques which enable a better implant integration in the bone structure, optimized comfort for the patient during surgery and speedy recovery after surgery. Our patients appreciate our open minded policy, the effective procedures requiring less follow-up visits, allowing a quick return to professional and social life.